The hardware in our MultiCompact inverter/charger range has been improved: it can now switch much faster from inverter mode to mains mode. Combined with our high peak power ratings, this makes it possible to switch to mains mode before shutting down in an inverter overload alarm. 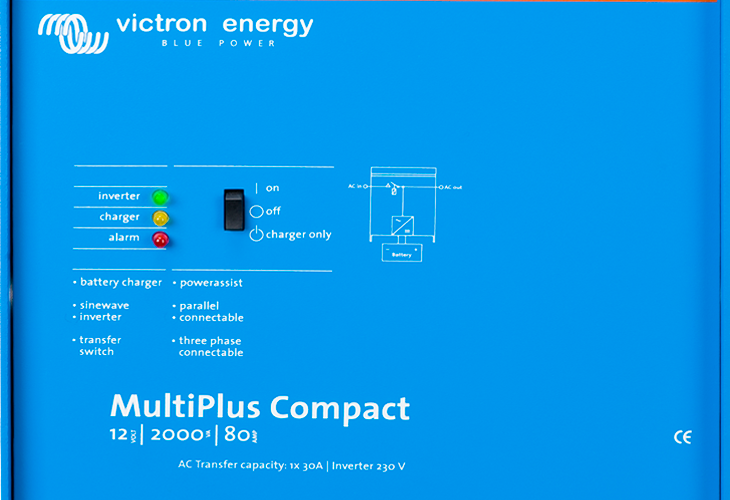 This is especially useful in Self-consumption Hub-1 and 2 installations: it allows using an inverter/charger with a nameplate power below the system power. Lots of little details, but all together the conclusion is that this significantly reduces the chance of a Victron switching off in overload condition. Because of stock and production logistics, it will be a while before all different models are shipping with the new hardware. Below table gives an overview of the current situation, from our main warehouse DSV in the Netherlands. The column serial shows from which serial number onwards this change has been implemented. And the column Shipping @ DSV shows if the new version is already being shipped from DSV. If you require a model that is not yet shipping as such from DSV, this is possible at an extra cost of EUR 50,= per unit.